Apple says the mobile game based on the Syrian civil war violates restrictions against games that "target a specific race, culture, a real government or corporation." Endgame: Syria is a relatively simple strategy game that challenges players to "make the choices to win peace as well as war" in the ongoing Syrian civil war. You can employ everything from U.N. sanctions to declarations of support from Arab and European nations, and array military units against the far-better-equipped might of the Assad regime. 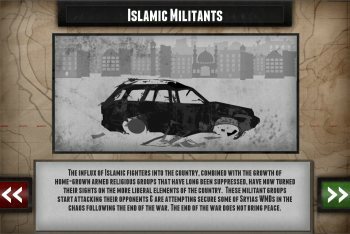 Every choice has consequences, and while it's not a terribly complex simulation it does offer insight into the challenges faced by the disparate opposition forces and the Syrian people. But don't expect to gain those insights on an Apple device, as The House That Steve Built has denied an application to release the game on the App Store. Apple apparently has rules against games that "solely target a specific race, culture, a real government or corporation, or any other real entity," and this game breaks them. "This decision is a shame, really, as it makes it hard to talk about the real world," Endgame: Syria designer Tomas Rawlings told VentureBeat. "We had hoped that Apple would be more nuanced in how they applied this rule, but we got a bit worried when it had been in submission for around two weeks without a decision - we then figured that because of the controversy of using the gaming medium to cover an ongoing war meant passing the game had become an issue for them." Rawlings said he understands Apple's desire to keep truly offensive material off the App Store, but there's nothing of the sort in Endgame: Syria. Developer Game the News is going to modify and resubmit the game, but that will inevitably take away some of what makes it noteworthy. "We'll have to strip some of the meaning and context from it to pass Apple's submission process and that is not ideal," Rawlings added. The good news is that although Apple wants nothing to do with it, Android owners can snag it free from Google Play. The APK and a web-based version of the game are also available at gamethenews.net.